Simply put, buying locally is not just something you do, but a way of life. Where do you even begin? Here are some practical ways to embrace what’s in your own backyard. No matter what you’re in the market for, chances are your community has more than enough home-grown options to meet your needs. However, it often takes research to know what’s out there. The big guys such as Home Depot and Stop & Shop may be easy to find, but the local guys are worth your time. Local businesses offer not only handcrafted products but a quality of customer care that can be hard to beat when you buy from a larger corporation or national retail chain. All it takes is a quick Google or Yelp search and a look at customer reviews to find exactly what you’re looking for. 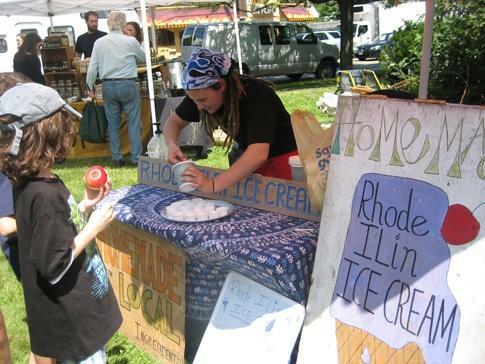 Locally, you can also find business listings through Buy Local RI, which exists to help consumers find just the place for what they need -- right here in our own backyard! One of the best cases that can be made for buying local centers around giving back to your community. Buying from conglomerates may get you what you want, but at the end of the day it robs municipalities of valuable revenue that is key to growth and a sustained quality of life. According to a report from CustomMade, local businesses have a tremendous impact on the local economy, generating 70% more local economic activity per square foot than big box retail stores. This is especially true in Rhode Island, where the state’s largest employers are small, local businesses. Buy Local RI cites a recent study that finds $100 spent at a local bookstore generates $45 worth of local economic activity, versus the $13 garnered from spending the same amount at a chain bookstore. Buying from an independent business is a reciprocal process that benefits you and them, so if you want to give back -- buy local. One of the biggest objections cited for not embracing local businesses and products is cost. Similar products can be found at a big box retailer or national manufacturer, but your dollar doesn’t actually go as far as you think. CustomMade also cites that the amount of money spent at local businesses generates over three times more wealth for the local economy than any dollars spent at chain-owned businesses. Opting out of local spending in this way may save you money, but it actually short-changes your community in the long run. Here in Rhode Island where Custom Built is anchored, we’re proud to be part of a community that unites around handmade, customized products and personalized service that the big guys just can’t deliver. People here truly understand that to grow your backyard, you have to nurture it and commit to it for the long haul, and we’re glad to be a part of that movement, from local food and art to quality-made home improvement products for homeowners in Rhode Island and southern New England.